The term membranes is usually taken to be synonymous with the amnion and the chorion laeve. The membranes represent the “bag of waters” that encloses the fetus. The membranes are distinct from the chorion frondosum, which is the actual placental tissue and forms a specialized, thickened part of the membranes. 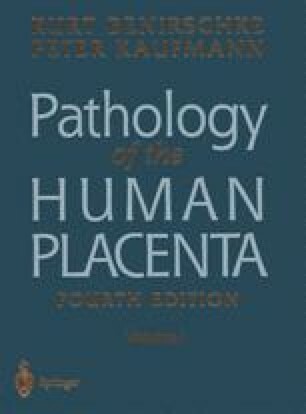 In other usage, placental membranes is occasionally also used as denominating the entire afterbirth. The true membranes normally insert at the edge of the placenta and contain the amnionic fluid and fetus. Membranes rupture during delivery owing to stretching or because of the mechanical force of the accoucheur. Several distinct layers are present in the membranes, and the structure and function of the membranes have received considerable attention primarily because of an interest in the turnover of the water they contain. Enzymatic activity of the membranes during the initiation of labor has been of additional interest. Most recently, the composition of the various extracellular connective tissue components has come under scrutiny (for review, see Bryant-Greenwood, 1998). Comprehensive surveys of many of these aspects, particularly the structural nature of the membranes, are found in Bourne’s (1962) and Schmidt’s (1992) books on the topic. The structural basis for premature rupture of the membranes was reviewed by Malak and Bell (1996).Amnionic fluid dynamics were reviewed comprehensively by Barnes and Seeds (1972), and they have recently been modeled by Mann et al. (1996). The turnover of amnionic fluid has also recently been reexamined by Gilbert et al. (1997) in rhesus monkeys undergoing chronic catheterization. The absorption of technetium-99m from the fluid led these authors to conclude that much fluid turnover occurs through the placental membranes.